Because like all of us, she needs to be every bit as loving to herself as she would everyone else. Today’s reading courtesy of the “Are you listening, Dixie?” Network. Those Chakra cards didn’t want to leave me alone for this daily! Here, we’ve got the Base and Crown chakras, poetically teaming up with the Eight of Cups, aka “Emotional Withdrawal” to describe future life.While the position of Future Life is technically supposed to refer to a future incarnation, I’m going with this incarnation here. I’m seeing this combo as very much a directive to give yourself space to release emotions, and especially painful and difficult emotions. If you allow yourself this gift, it will help you moving forward both physically, in your everyday, mundane life (Base Chakra) and spiritually , in the grander scheme of existence (Crown). Pain comes in much like ocean tides. As does anger, or frustration, or fear, whatever emotional nemesis you’ve got going. It washes up and rolls over you, and then washes out offering some relief. Ebbs and flows are inherent in managing difficult transitions. Accept and give yourself the time and space for this. Don’t allow anyone to tell you the “right way” to feel. Even if that someone is you! See, there’s only really one surefire way to release the past and truly move on from it: ACCEPT it and the feelings it engenders unconditionally. In doing so, you allow integration, which makes fully living in the present possible. Your life experience is part of who you are! It’s valuable, if not always easy. It can offer wisdom and depth and compassion, if you allow that. And to do all this work? Time out, away from demands to lessen the potential of emotional overload. It’s laudable to offer assistance for others. But we’re most capable when we’ve cared for ourselves well. Are you pulling back to process? Lovely Queen didn’t ask a question, so we’ll hop straight into whatever the cards say. Short Answer: A few simple adjustments can really torque up your connection. BELIEVE you’re doing it. You are! Get in a good space before you start your work. The higher you can lift your vibration beforehand, the more tangible and dramatic the results. Set the scene – have specific, consistent elements of your practice to help program yourself to get that vibration adjusting up as you prepare to work. 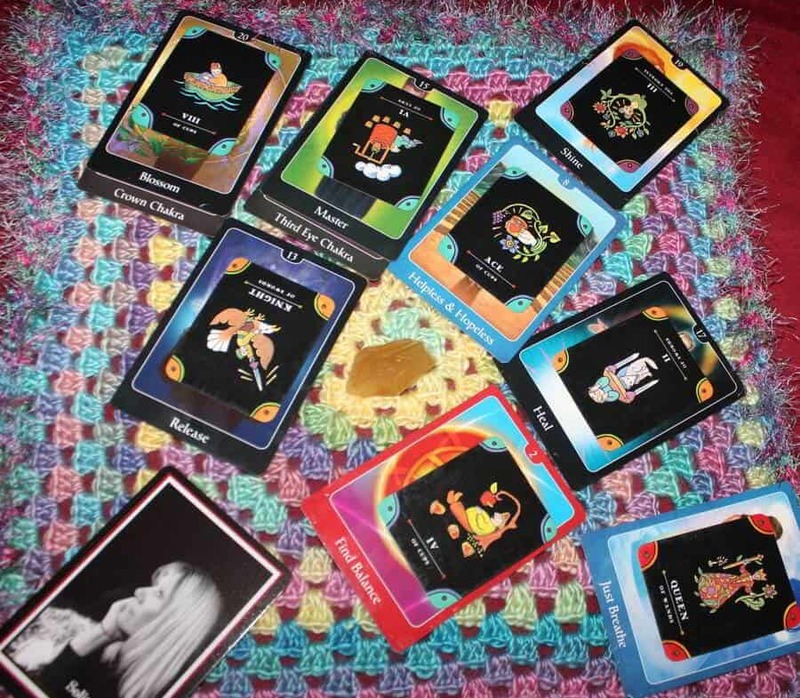 Ready for your own reading? Get yourself a full Chakra Check-in today! Gotta love that Libran politeness! Let’s see what advice the cards have for Caroline. Find out more about working that connection with the upcoming Chakra workshop or just get a private Tarot consult. Me too! So let’s see whatever it is we do get. Short Answer: The cards are focusing on opening up to the divine, but very specifically. In short, YOU can be in the drivers’ seat instead of feeling like you have to accept whatever you get, however you get it. Trust it! Negotiate with your spirit team, set parameters, and ask for help in learning to manage the particulars of your connection, and you can stop being overwhelmed and start reaping the benefits of your gifts. Much love on your quest, Dear. Anytime I work with the Psychic Tarot Oracle, there’s a chance I’m going to run into some Chakra cards. The first few times I pulled these, they annoyed me to no end—along with the lack of Tarot Court cards and (for reasons unknown), the missing Tarot Tens. But I’ve come to see them as more useful than I did at first. Especially since I recently read with this deck and found the Throat Chakra showing up to answer a medical query. But I digress. Here, I see a pretty simple prescription for creation and joy: Connect to source, the divine energy. Shore yourself up physically, energetically. Ground! Both above and below make up the recipe. Once that’s done, rejoice and share within your community. The short version: You are not alone.